We’ve been living in rural Ireland for a shade more than thirty years now, and the household’s online connectivity has been a bit of a challenge from the very start. Then the Internet started to become accessible, and for that too there was dialup, slow and clunky and expensive as it was. If you wanted anything better, for a long time satellite was the only way… and it was insanely pricey. (The equivalent of $250-350 per month wouldn’t have been unusual.) For a long time we struggled with that, looking wistfully forward to a time when local providers would be able to offer something like the faster, cheaper methods that were becoming available in the US and in big cities in Europe. For a long time the providers here lagged behind, until finally in the very late 1990s and early 2000s they started to catch up. We happily enough gave up the satellite for DSL (at least a bit more reliable: the satellite had tended to get wonky in wet weather) and then ADSL. And then slowly the national phone company started to introduce fiber… though only in big cities. We moved to our present house in the late 90s and watched other areas of the country gradually get better service and have access to all kinds of goodies that were far beyond what ADSL and its kin could provide us. Then came true hardwired broadband, and the nature of our problem abruptly changed. Our tiny local exchange, home to maybe no more than a few hundred subscribers, was too small ever to be broadband-enabled. And none of the companies that kept buying the national phone company, and passing it from hand to hand like a hot potato, had any particular interest in committing to the infrastructure spending that would pay for (among other things) running fiber out to the likes of us. 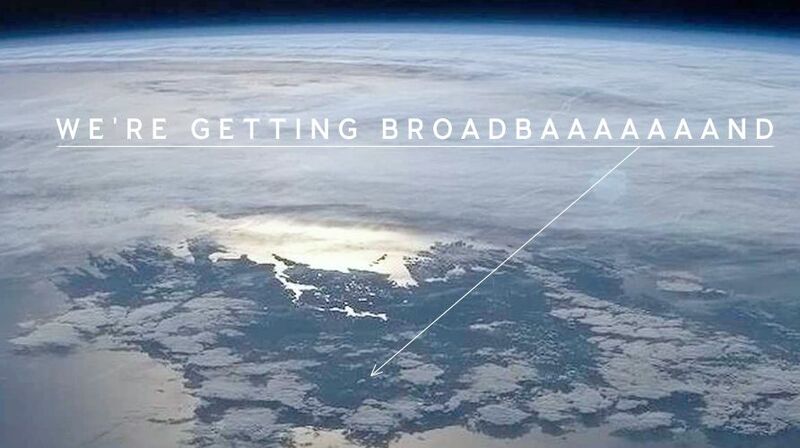 We heaved a sigh, as it seemed likely that the only way we’d ever get broadband was to move. Then dialup vanished, leaving us with only one option that wasn’t satellite: cellular broadband, running off a router that would only function when placed as high as possible in an upstairs bedroom window, since our local mobile service is so funky and we live in the shadow of a hill that keeps us from getting a signal of any significant strength. And has a tendency to fail out when it rains. To say that, as people who as part of work need to have an online presence, and who run an online bookstore, this whole situation has been pretty frustrating… would be putting it mildly. The government here wasn’t insensible to this problem, to their credit, it being shared by hundreds of thousands of other people nationwide. As a result there ensued something called the National Broadband Scheme, intended to get the national government involved as a partner in extending broadband service to Ireland’s most rural users. This proposition started out well enough but then rapidly started going through more plot twists than a George R.R. Martin novel (and nearly as many corporate casualties, as participants fell or were pushed out of the scheme, depending on your point of view). Finally it expired of its (political and other) injuries, to be replaced by the National Broadband Plan. (Which also started to look distinctly peaky after companies began dropping out of it as if they’d drunk out of the wrong bottle at a royal banquet.) Leaving us, like many other people all over the southern part of this island, in a situation where the Moon had better internet than we did. Yet in the most recent twist in the tale, what remains of what used to be the national phone company — an entity now called Eir — swooped in and creamed off some of the most accessible of the rural routes that the Plan was supposed to see equipped with the very best state-of-the-art, fiber-to-the-door broadband. And by what can only be considered sheer luck, one of these involves the little rural road we live on! A man in a van came and discussed with us what service we wanted, and gave us a contract to sign, and we signed it. And when he left there was singing and dancing around here that could have been confused with something out of an old Savarin commercial starring their picky coffee expert, known as El Exigente. “And the people are happy!” Cue the mariachi band. The very thought of at last being able to do the online things other people do — streaming (impossible with our expensive cellular broadband, which has been our last-resort solution for years now), seeing video content from online providers (bwahahahahaha you must be kidding, we’d burn through a 20-gigabyte / $50 cellular topup in a matter of hours), backing up our computers to the cloud… It was heady stuff. So many useful possibilities that other people take for granted would at last become available to us. Except… maybe that excitement was a little premature. …So now we wait. I’m practically giddy with excitement now. I finally get to SEE American Gods? I finally get to stream the audio from the Romansch-language channels in Switzerland and that terrific bundle of classical channels in France? OMG.